Use our interactive sky map HERE to find out if you can see Mars right now! Be careful when viewing Mars if it is close to the Sun. The Sun can damage your eyes so ensure it has not risen before attempting to view Mars. Never look at the Sun through a telescope without using a special solar filter. Even catching a quick glimpse of it whilst searching for a nearby planet could cause irreparable damage. 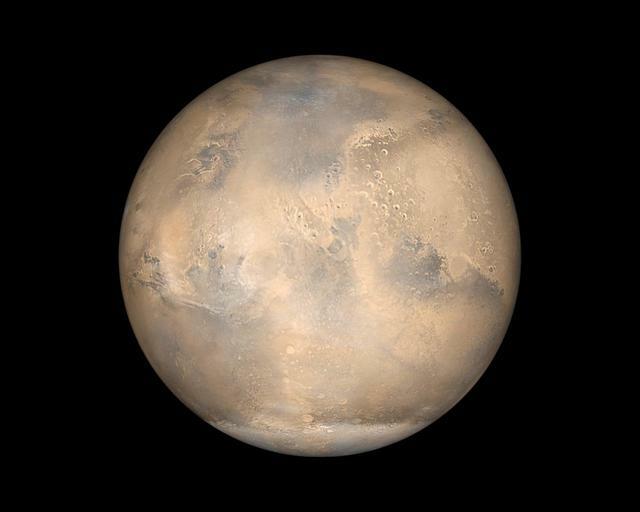 Mars is the fourth planet from the Sun, it is also known as the 'Red Planet'; it gets red colour from the iron found in its surface. Mars has two moons, Phobos and Deimos. Mars is home to Olympus Mons the tallest mountain known in the solar system! No fancy equipment needed to view Mars, it can be seen with the naked eye! Mars is a difficult planet to observe! It will look very small in a telescope making it's features difficult to see. Don't let that stop you though, it's still possible to view and image. 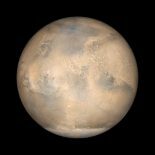 Mars is an evening and morning object this month. It can be seen from dusk around 20:00 in the South/South East at the start of the month, and around 19:00 later in the month. It sets in the South West around 01:00 at the start of the month and around 00:15 towards the end of the month. Saturn can be seen to the right of Mars for most of the month! This image shows the location of Mars at 20:15 on the 15th of Sept. This image is a screen shot from Stellarium, a fantastic piece of free software. Click this box to find out when and how! See where the darkest skies are in the area! Click this box to find out where! Find out if the Aurora is forecast! Click this box to find out!